Hepatitis C is a chronic, infectious disease that affects approximately 250,000 people across Canada. 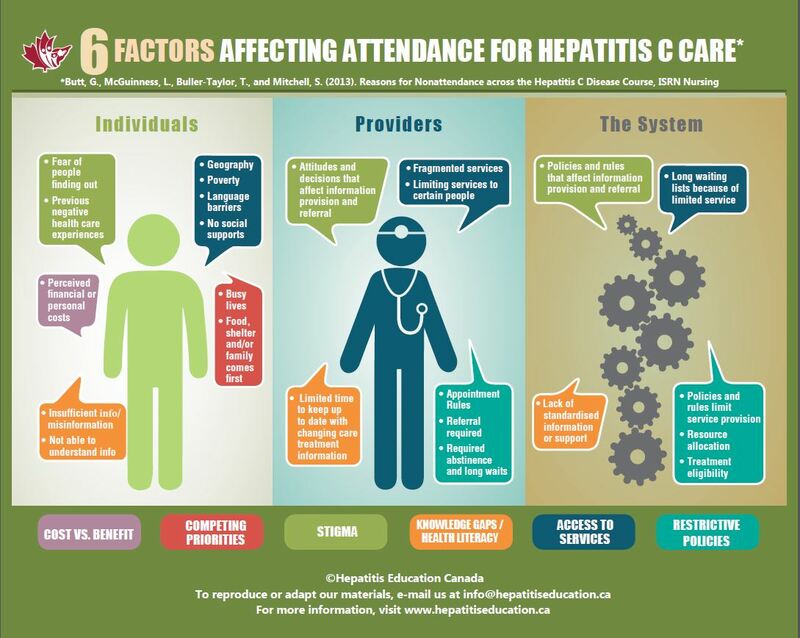 Although it is recommended that those affected receive regular care to monitor and manage their condition, reports from health care providers indicate high rates of non-attendance for hepatitis C care and a need for greater understanding of the issues behind non-attendance. Guided by a national advisory committee made up of people affected by hepatitis C and health and social care providers, this study aimed to explore why people attend, delay, defer or do not seek care for chronic hepatitis C. Information was gathered through 55 individual interviews (telephone and in-person) with those affected and group sessions with 29 health and social care providers from across Canada. For some, non-attendance was a way to avoid possible negative impacts of the disclosure of their hepatitis C status or to protect themselves from negative care experiences. Participants described numerous issues that influence the decision to attend, delay, defer or not attend care, such as being told by a provider that follow-up care was not needed, feeling healthy or that care was pointless, past care experiences were not perceived as beneficial, or the personal costs of lifestyle changes or doing antiviral therapy were felt to be too high. Many participants described priorities that needed to be managed in addition to hepatitis C, including other health conditions, life instability and/or responsibilities such as work or family. Both patient and provider participants reported knowledge gaps and misinformation about hepatitis C and its management and treatment. Difficulties understanding hepatitis C information and sorting through information from multiple sources, which in some cases conflicted, was also reported. A number of participants reported care being unavailable, particularly in rural and remote areas, or difficult to access due to financial costs, wait times and the lack of integrated or culturally appropriate care. Clinic policies around making and keeping appointments were barriers to accessing care for some. Abstinence requirements of some providers, the necessity of a referral to see a specialist and provincial eligibility criteria for anti-viral therapy were other issues that contribute to non-attendance.These findings show that the reasons for non-attendance are related to multiple interacting factors at the patient, provider and systems levels. In response to these factors, study participants recommended integrated health and social supports, improved education and standardized follow-up protocols for patients and providers. For more detailed information about the results or the six factors see our project report (PDF) or narrated PowerPoint (Videos).